Tavern Druga Kuća is located at No 27 Nušićeva Street, precisely across building of Politika. This tavern is one of most popular taverns in Belgrade. Tavern Druga Kuća is exactly what it names says your second home. This is place where you are always welcome, where you can relax, enjoy, grieve, sing, be happy, fell on love with someone or or even get over someone. 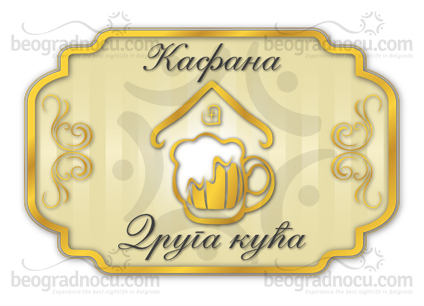 So, tavern Druga Kuća is ideal for every occasion. Besides all that, tavern Druga Kuća is ideal for different profiles of people and it's really lovable and will delight you at your first visit. Tavern Druga Kuća is opened even seven days a week that makes it unique in the city. Working hours are from 10 pm until 3 am in the morning. And believe it or not this still isn't enough for its guests, since they always want more. Interior consist of three parts and it's been decorated with in perfect combination of wood and stone, tables with plaid sheets, which gives you a feeling of comfort and contributes to your bohemian pleasure. This tavern is very spacious so besides great interest, there is a lot of place for dancing. Tavern Druga Kuća has excellent ventilation and surround system, that will contribute your pleasure in delicious wine tasting and sound of string instrument. Since music is wired you can hear it all over tavern. Tavern Druga Kuća is known for excellent gigs and happy guests, as well as for friendly staff always ready to serve you or even talk to you. Tavern Druga Kuća takes care for everything, even the smallest details that will make difference beetwen god and bad nigth out. Thei famouf motto is: ''It wasn't drunkenness, if you are not ashamed of it after three days. '', so you are expected to behave precisely like that.